Background: Mycobacterium tuberculosis as an intracellular pathogen causes Tuberculosis (TB). Due to the long time required for treatment, hepatotoxicity of drugs and also emergence of Multidrug-Resistant (MDR) and Extremely Drug Resistant (XDR) strains, TB is currently a major public health problem. Some medicinal plants possess remarkable activity against Mycobacterium. Among them, Lamiaceae family are of pharmaceutical interest because of their potential antimicrobial properties. The aim of the study was to evaluate the in vitro activities of Satureja rechingeri, Satureja khuzestanica and Zataria multiflora against MDR M. tuberculosis and two Non-Tuberculous Mycobacteria (NTM). Methods: The essential oils were prepared by the standard method. The confirmed strains were obtained from the microbial collection of Tehran University of Medical Sciences. 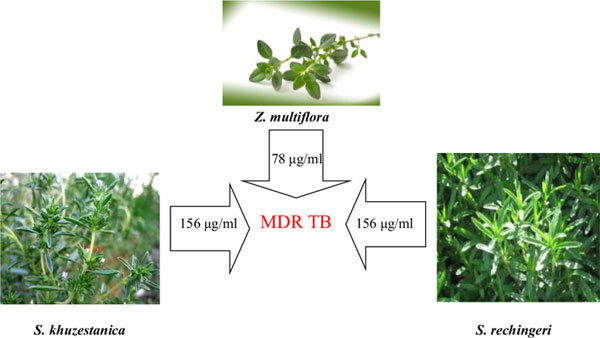 Minimum Inhibitory Concentrations (MICs) of essential oils of plants against mycobacterial strains were determined using standard broth microdilution method. Results: MDR M. tuberculosis was completely inhibited by Z. multiflora at 78µg/ml concentration. S. rechingeri and S. khuzestanica also showed same anti-mycobacterial activity against MDR M. tuberculosis with MICs of 156 µg/ml. The MICs of the essential oils against M. tuberculosis H37Rv, M. kansasii and M. fortuitum were in the range from 39 to 156 µg/ml. Conclusion: The studied medicinal plants showed notable effects against mycobacterial strains. Our results indicated that utilization of Lamiaceae family can be helpful for treatment of mycobacterial infections. Anti-mycobacterial, Satureja rechingeri, Satureja khuzestanica, Zataria multiflora, essential oil, novel drugs.